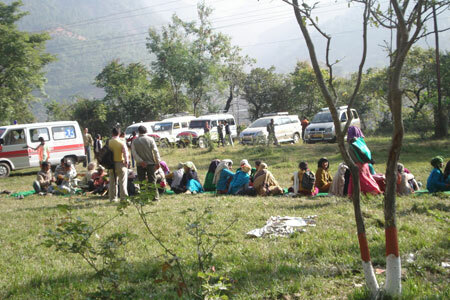 Amma had instructed that we should have medical camps in our new Uttarkashi camp. As per these instructions we had a camp earlier where a group of doctors and para-medics visited many villages holding camps there and ultimately conducted a general medical camp in our ashram. 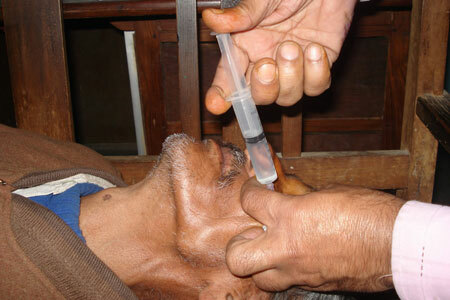 In collaboration with the Society for Prevention of Blindness, we planned to conduct cataract removal operations, the screening for the same being done in our Uttarkashi ashram. It was a first time for us. 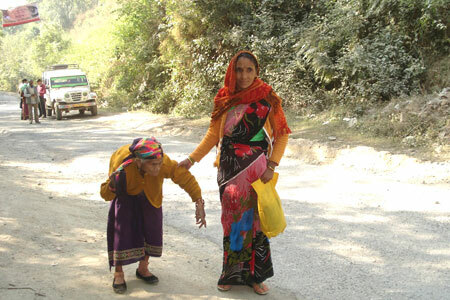 A group of 12 volunteers from Delhi set out with whatever we could carry. 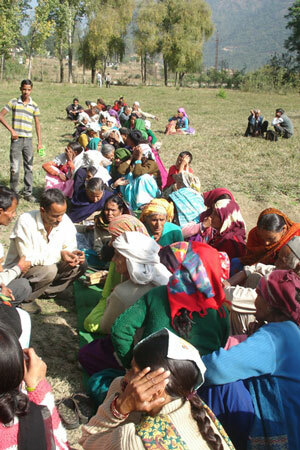 We had already arranged for two Trax vehicles to go around to different villages and spread awareness about the camps. The intention had been to initially have the screening done at our ashram and after a few days conduct the operations at the District Hospital. 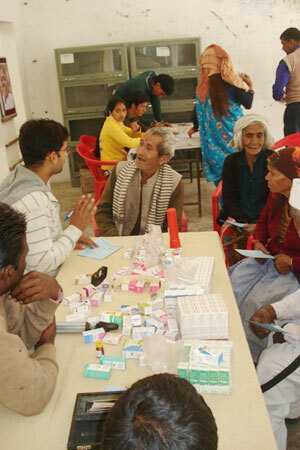 It was with this idea that we had arranged the schedule of doctors and others. BUT when we reached Uttarkashi we got such a different picture that all our plans went for a toss. We were told by the local medical authorities and some other people who provide medical services gratis that the local people would not come twice – if we did not get them on their first visit they would just melt back to their villages and a good percentage would not return. Then there was a mad scramble to rearrange everything – the surgeons and their teams, the local volunteers, arrangements for accommodating the screened patients and their by-standers, transport arrangements from the ashram to the accommodation and from there to the hospital and back, arrangements to host thousands of people who would come for the screening – food and seating arrangements, painting and plumbing work at the ashram – and on top of all this work we had to spare people who would visit distant villages to identify patients if they could, or just to inform people of the camp. We had all of three days to finish all of this work!! 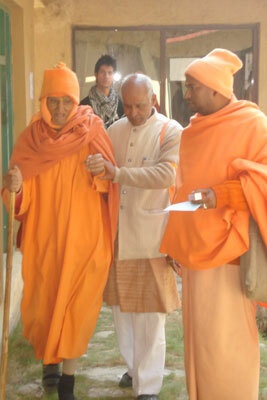 And being an ashram project we were spending where we obviously had to but were trying all to save money where we could. The idea being that we could use the saved money for some other needy people. Wandering all day long in local villages, some times without food and then coming back to the ashram to bathe and do bhajans and then have dinner and then again start work – scraping painting and making the ashram ready to receive so many people. But where there is a ‘will’ oops Where there is Love or Amma, there is always a way. Many ways in fact. Obviously we had to work hard and try to garner resources from wherever we could, but Amma arranged it so that we had everything we needed. Many people came forward to help. So on the day of the screening everything was ready – the volunteers had been primed – announcements were being made on a mic about the arrangements and the system we were following. Everybody was given tokens and they were called according to their token numbers. Many Sannyasins from local ashrams (everyone knew Amma, most had met Amma too) came to help – some to help cook food, some to register the patients(the government requires details of patients), some to help the really old to move from one room to the other. One sannyasi took it upon himself to set up a tea stall(free) right outside the Operation Theater – he was serving tea, coffee and snacks. So any of the doctors or technicians or volunteers could have a hot beverage and something to munch. And it was needed too – as the doctors used to operate till 2am or so. They were used to this grueling routine. 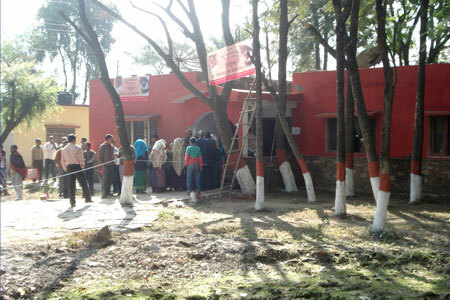 The screening and operations went on for 3 days. After an additional day of observation and ensuring that everyone was ok – the doctors let the patients leave with instructions on do’s and dont’s. 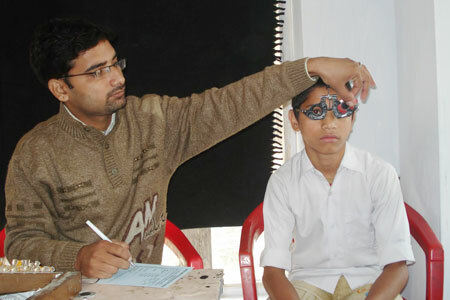 Arrangements had been made with the local medical superintendent to further examine the patients and provide them with spectacles. 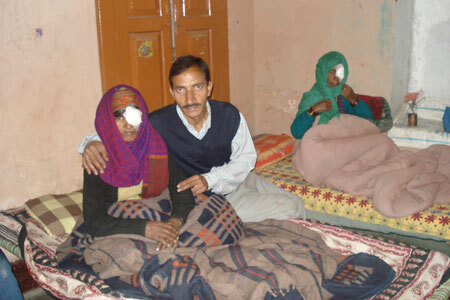 Ultimately 103 patients who had been screened and operated on were able to see clearly again. Most of the patients were very old. 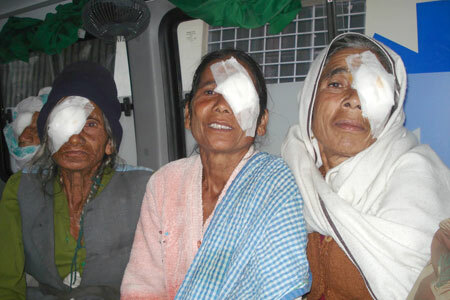 It was such a pleasure to see a smile on their faces as the bandages were removed and they were able to see clearly again. There was not even a single complication. All Amma’s Grace. 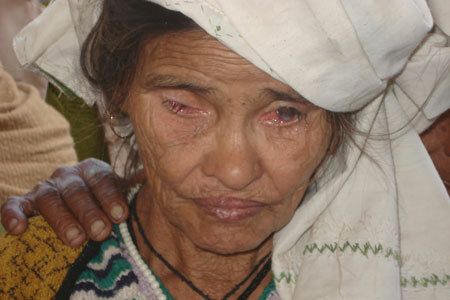 On the whole it was a moving experience to restore sight to the blind. May Amma remove our spiritual blindness too.